Nice work Nancy. Thanks for the tip on Pictochart too. Oe way to model 21st century skills is to show kids that when you don’t know the answer to a question, or need some information, is to look it up. Of course kids should be looking stuff up themselves, but it won’t hurt to model that behavior by looking stuff up yourself in class sometimes. Really liked you Piktochart, it helps to bring the topics of the Elements out. 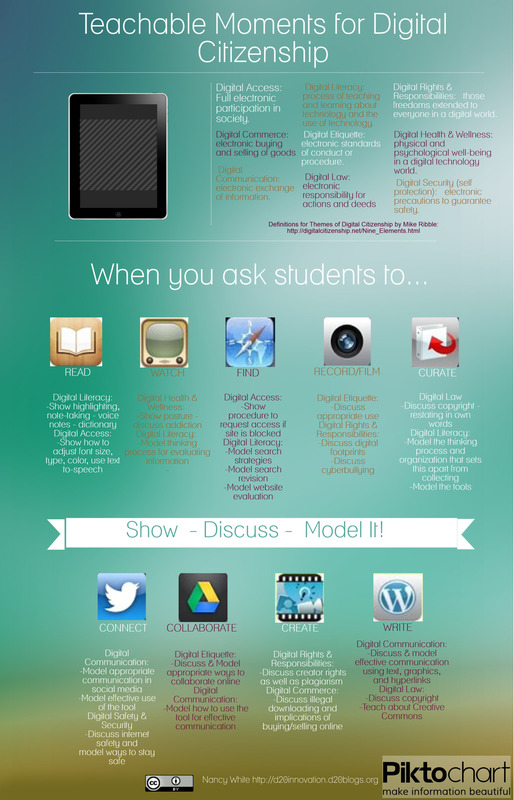 As more are going to iPads (and other mobile devices) it is nice to have a direction for teachers how to use the devices and apps with them. We are looking to create a week of Digital Citizenship activities in Oct., let me know if this is something you would like to participate in. Thanks, Mike! I’d love to be involved in your October event. I sent an email to your yahoo email account – hope that was the right one to use!